Outside the city is a power outagecommonplace, and the "young" holiday villages can still be a long wait when all will be communication for comfortable living conditions. Therefore, it is often in the evening territory plunged into total darkness, and walks accompanied by the necessary flashlight. Completely solve the problem of lights with solar batteries, which can be installed anywhere. 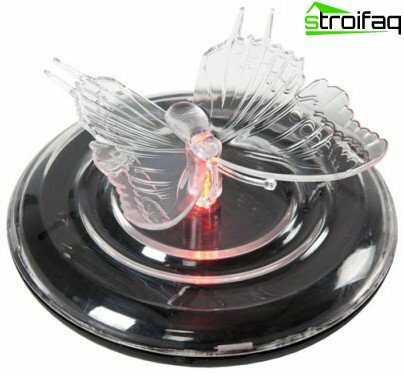 The light source in this model isLED lamp, batteries - solar battery. It converts the sun's energy into electricity. During the day the battery is charging, and at dusk, and powers the lamp illuminates the area. If it was sunny, charge enough for 10 hours in cloudy weather time is reduced by almost half. Important! Batteries fixtures installed in the shade, can not be fully charged. This is a real find for the budget conscious peoplewho spend the lighting only when necessary, trying to minimize the payment of electricity and installation expenditure. 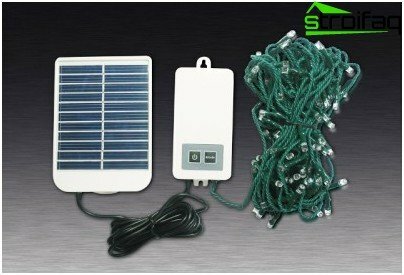 With Solar-powered lights it is possible not to worry. The advantages of this lighting are undeniable. 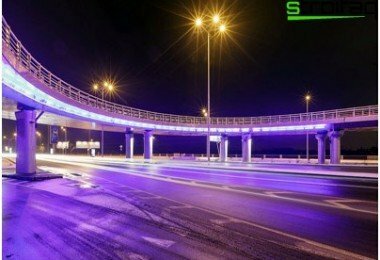 Costs have to incur only for the purchase of luminaires and electricity for their work is not completely necessary. It eliminates the need for cabling, automatically exempt from the problems associated with the purchase of necessary materials, trenching and payment services electrician. No need to change bulbs. Installation is very simple. Lanterns just go deep into the ground sharp tip. They can be moved to any position for convenience or experiments with decorative lighting, clean the house before a long absence. Maintenance consists in clearing damp, soft cloth. 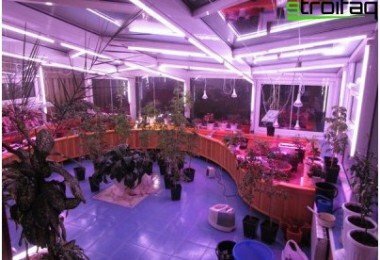 Products do not lose the appearance and functional characteristics, being on the open air. Create an original landscape design. Various options allow the price to buy the desired pattern in a certain amount. 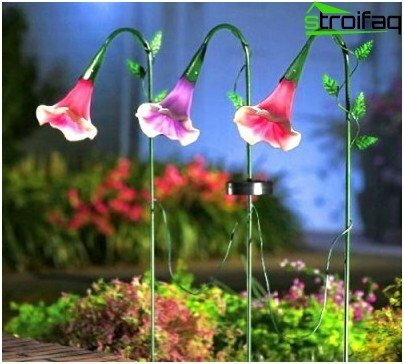 Garden lights with solar batteries come in different sizes and configurations. The height of up to 2.5 meters are installed in the ground tolighting paths, gazebos, benches and other seating areas. The same function is performed by lamps located at the ground. Lanterns can be cemented and not to remove from the site, then they will illuminate the road on arrival in the dark. The alternative they are the wall model. From the name easy to determine what is the point of attachment for a fence, pole, wall of the house or other buildings. 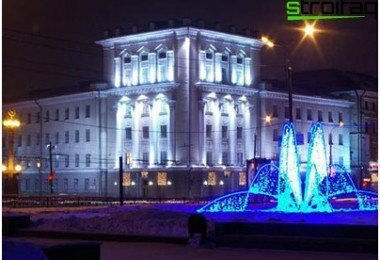 Lights in the form of columns and Bollard serve to illuminate walkways and decoration area. They look very impressive. Built-in models are most often used for stairs. This can be a structure that leads to the house and other buildings of functional and decorative purposes. Underwater lights illuminate the pool, fountain, pond. Mounted to the water tank filling. 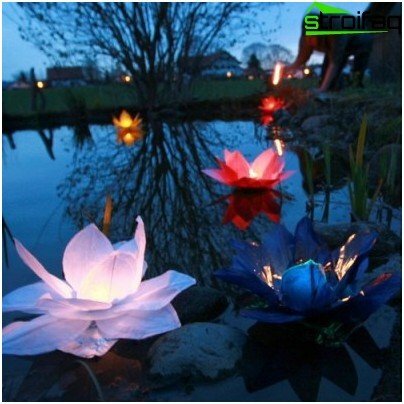 Waterproof lamps mounted onwater may be in the form of a ball, lily, fairy-tale character. The picture becomes even more beautiful with a light breeze, which results in traffic lights. 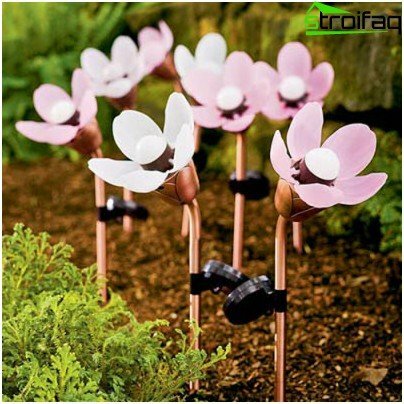 For flowerbeds and lawns should choose a model in the form of flowers, butterflies, dwarfs and little animals. 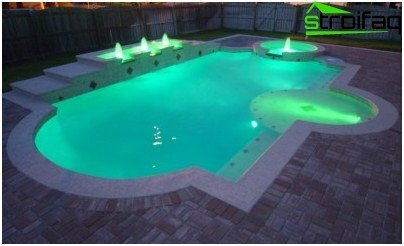 During the day they can be virtually invisible, and in the evening becoming decoration landscape design. Garlands used to highlight trees and shrubs, and can be attached under the roof of the house, gazebo, on the veranda and terrace. It is interesting! If the batteries are located in the window on the sunny side, and a garland - inside the room at the mirror on the outside it looks like a working TV, so may well scare off intruders. Create a festive mood lights with colored LEDs. For daily coverage of their use is not necessary, but for the celebrations will be very handy. 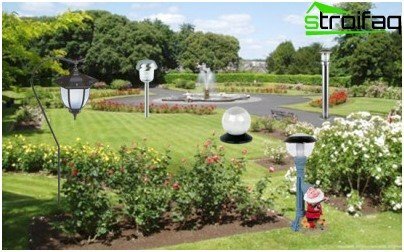 Any model can be supplemented with sensorsmovement (it is convenient to be installed along the tracks and in the place of parking) or device that holds the battery in charge mode during the day and at dusk switches for lighting. 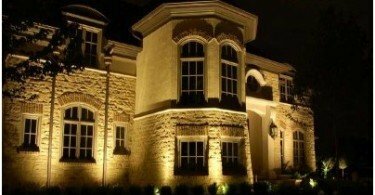 Large range of products allows you to choose to illuminate any area. The owner only needs to allocate a top priority of quality. Lamp housing are made of plastic, metaland wood. Special processing allows for a long time to maintain the original properties. For metal is powder paint for wood - Floor against rotting, cracks of and rodents. But plastic additional treatment is not needed. Smooth has a maximum bandwidth. The reflex does not reflect the direct sunlight. 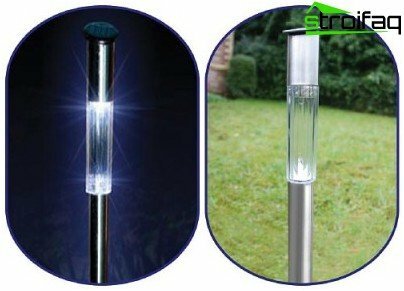 Street lamps with solar batteries with glass ideal for cloudy weather. Toughened - the most reliable. Moreover, the price difference is only 5-10%. Nickel Metal Hydride. These models are more expensive. However, their use will eventually becomes economically advantageous because they have a long life. Polysilicon is used for manufacturing cheap batteries. For the second season, they can only 4-5 hours. Multicrystalline more practical. For proper operation serve for several years. 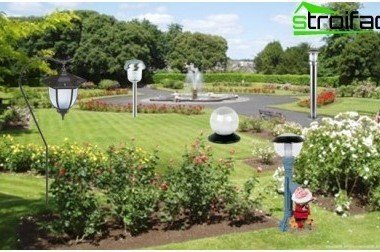 Monocrystalline solar batteriesstreet lamps are the most reliable. They are covered by a protective oxide film which does not impede the dispersion of light. They have a high resistance to chemical and climatic influences, but this version of the budget can not be named. 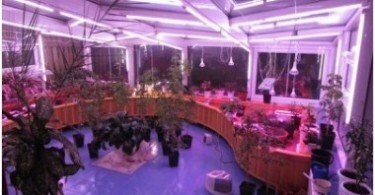 Due to the high demand for the product fedsolar energy, the number of producers is growing exponentially. Only here sometimes quality does not meet even the minimum requirements. So when you buy should pay attention to packaging. It must have the following characteristics indicated. The power and the number of LED lamps. The higher the score, the greater the area the lamp illuminates. It can be installed lamps 10-15. Hours subject to fully charge the battery. The larger the area of ​​the battery, the more intense the return of the solar energy. 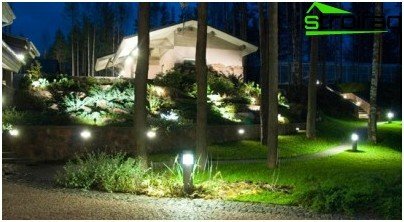 Lighting serves the suburban areaseveral functions: excludes injuries due to the movement in the darkness, reduces the risk of malicious intrusion, decorated with landscape design. And after the piece of equipment would be desirable to devices served as long as possible. For admission to the battery more light it is necessary to periodically wipe the surface with a damp soft cloth canopy to prevent damage to the protective film. The simplest is a bad faultthe relationship of the battery and supply container. This is due to the oxidation of the particles in the joints. In this case, it is necessary to disassemble the lamp and clean the contacts of the container supply and battery pole. 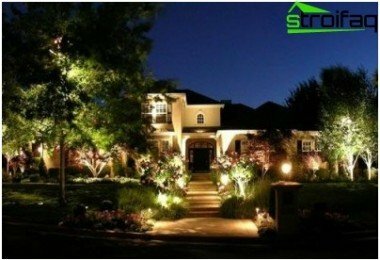 Many options allow garden lightsyou arrange landscaping. And objects, plants, which in daylight does not have great aesthetic value, at night create the impression of a fabulous town or castle. 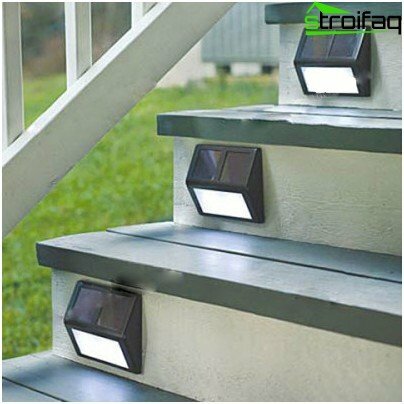 Solar-powered lights can be used to illuminate the inside of the house. They charged while on the street or windowsill.